At the end of the Malayan Emergency Australia agreed to keep forces in Malaya-Singapore as part of the British Commonwealth Strategic Reserve, and the RAN had two frigates, Yarra and Parramatta there on duty when the Indonesian policy of 'confrontation' began with the new nation of Malaysia . Malaysia had been formed in 1963, embracing the British colonies of Malaya , Singapore (later to withdraw) Sarawak (North Borneo) and Sabah . Fearing that the new Federation posed a threat, Indonesia 's President Sukarno decided to demonstrate Indonesia 's opposion to the new nation. Indonesian forces made shore landings in Borneo and Malaya, paratroopers were dropped into Malaya early in the confrontation and naval skirmishes occurred in the straits of Malacca. Grave fears were therefore held for the stability of the region. As tension mounted, Australia increased its presence by sending HMAS Sydney , the destroyers Vampire , Vendetta and Duchess and the frigate, Derwent to the area. Sydney had by now been converted to a fast troop transport and carried troops and equipment to Jesselton in North Borneo . 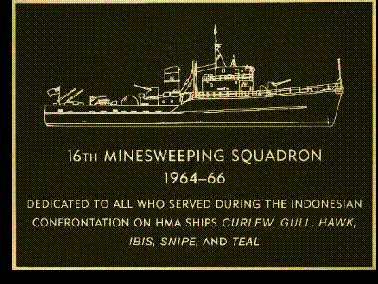 The 16th Minesweeping Squadron comprising six Ton Class coastal minesweepers was also assigned for duties during Confrontation arriving in Malaysian waters in May 1964. Initially their patrol duties were centred in Borneo . They had a standard displacement of 360 tons, a maximum speed of 15 knots, a crew of three officers and 30 ratings and were armed with two 40/60mm Bofors guns, together with light automatic weapons. On 13 December 1964, as if to echo the Prime Minister's concerns, the minesweeper HMAS Teal, Lieutenant K. Murray, RAN, whilst operating as part of the Singaporean Straits patrol, was fired upon with automatic weapons by an unlit vessel. The attacking vessel (one of two) then shaped course for Indonesian waters but was overpowered and arrested by Teal following a further small arms engagement that resulted in the deaths of three Indonesian crew members. For his coolness and judgment during this, and a previous, interception Lieutenant Murray was awarded the Distinguished Service Cross, the only award for gallant or distinguished service made to the RAN during Confrontation. Teal was involved in another interception on 23 February 1965 when she detected an unlit vessel nine miles off Cape Rachado . The suspicious vessel was closed and illuminated, and revealed nine fully armed infiltrators in uniform who surrendered immediately upon challenge. The contacts between December 1964 and February 1965 were symptomatic of a period of considerably heightened activity by the Indonesians, and although few of their infiltration parties actually made it ashore in Malaysia , the level of effort required to stop them stretched the security forces considerably. 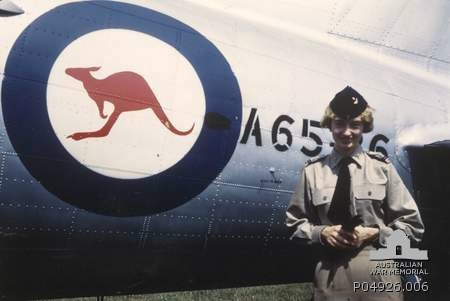 Teal was not the only ship of the 16th Squadron to see action. On 13 March 1966 while patrolling off Raffles Light HMAS Hawk , under the command of Lieutenant J.D. Foster, RAN, came under fire from an Indonesian shore battery, even though the minesweeper was inside Singapore territorial waters. Two salvoes totalling 11 high explosive rounds were fired at the ship, landing within 200 yards of the vessel. Hawk retired at speed, and without retaliating, since fire ceased immediately the minesweeper got under way. The following morning Hawk 'evened the score' when it intercepted a sampan with five Indonesians on board who were promptly arrested. This trend of interrogating suspicious vessels and making arrests continued throughout Confrontation. It was hard, long, tedious and exacting work with little to show as a result. During a five-month period on patrol activities in 1964-65, HMAS Ibis spent 87 of 100 days at sea. Throughout Confrontation the small Ton Class Minesweepers proved to be a worthy gunboat with a useful all round capability. However it came as no comfort to those onboard to know that they were out-gunned by nearly every Indonesian warship in the region. As Indonesia continued its 'confrontation' the British organised substantial naval forces to defend Malaysia . RAN destroyers, frigates and minesweepers maintained their patrols in the Malacca, Singapore and Johore Straits and in the Tawau area of North Borneo as well as joining in exercises with fleet units of the Malaysian Navy. 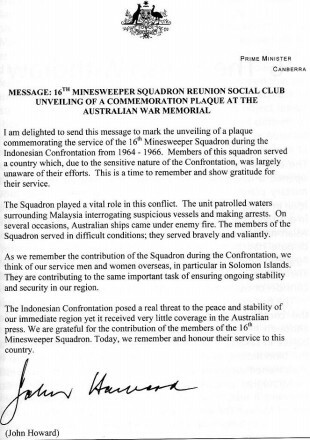 When Indonesian forces crossed the border into eastern Sebatik Island near Tawau, Sabah on 28 June 1965, HMAS Yarra was called on to carry out bombardments designed to harass the withdrawal of the infiltrators. During three runs Yarra fired a total of 70 rounds. 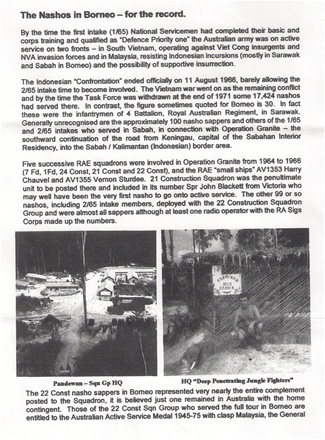 Bombardments of the border area of Sebatik were again carried out on 5 and 10 July, the targets on all occasions being within Sabah. The Far East Strategic Reserve maintained an on-going presence in Southeast Asia until 1971 at which time the Five Power Defence Arrangements came into effect replacing the arrangements of earlier years associated with the Anglo-Malaysian Defence Agreement.